After School Matters’ Summer Teen Cuisine lunch buffet series has returned this summer. 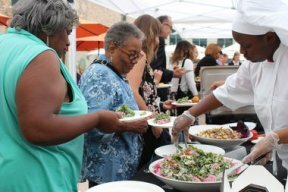 Teens from the Advanced Culinary Arts program will recreate menus from prominent Chicago restaurants alongside executive chefs for four more weeks this summer. This week, more than 20 teens in After School Matters worked alongside the executive chef of Black Bull, Chef Marcos Sanchez – learning techniques, tips and tricks of the trade while preparing a gourmet meal. 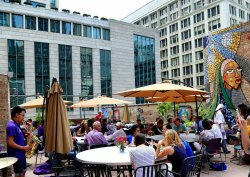 The Summer Teen Cuisine takes place on the rooftop of Gallery 37 Center for the Arts ($15 in advance | $20 at the door). Below is the series schedule and restaurants for each week. All lunches are 11:30 a.m. – 1:30 p.m.